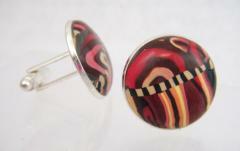 These large round cufflinks feature a combination of kaleidoscope patterns, swirls and stripes in reds, oranges, yellows and bronzes. They are created with intricately handcrafted canes of polymer clay, the results are always individual and cannot be reproduced, which supports my core ethos of creating jewellery which is as unique as you are. These Silver Plated cufflinks are secured with a simple swivelling bar.